Bahco 21 inch bow saw, comes complete with type 51 bowsaw blade, which makes it ideal for cutting both dry wood, and fresh green wood. Small lightweight frame saw - ideal for all-round use and pruning. 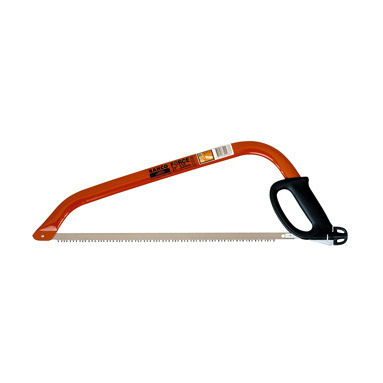 Narrow pointed nose makes this bow saw ideal for gardening work, as it allows the user to work in confined spaces such as trees and bushes. Highly-tensioned Bahco type 51 blade enables effortless precision cutting. Ergonomic handle prevents knuckle damage. Made from hardened steel, which guarantees long-lasting performance. Finished in high-impact enamel paint to protect against rust and corrosion.